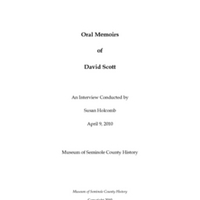 An oral history of David Scott, conducted by Susan Holcomb on April 9, 2010. Scott was the son of Grady Scott, who served as Superintendent of the Old Folks Home, formerly located at 300 Bush Boulevard in Sanford, Florida. The property has since been converted into the Museum of Seminole County History. In this interview, Scott discusses the layout and residents at the home, his responsibilities as an employee, growing up in Sanford, and how Sanford has changed over time. Oral history interview of David Scott. Interview conducted by Susan Holcomb at the Museum of Seminole County History, Sanford, Florida. Scott, David. Interviewed by Susan Holcomb. April 9, 2010. Museum of Seminole County History, Sanford, Florida. Originally created by Susan Holcomb and David Scott. "About the Museum of Seminole County History." Department of Parks and Preservation, Seminole County Government. http://www.seminolecountyfl.gov/departments-services/leisure-services/parks-recreation/museum-of-seminole-county-history/about-the-museum-of-seminole-county-hi/. Today is April 9th, 2010. My name is Susan Holcomb. I’m here interviewing David Scott about his time when his dad was Superintendent here at the Old Folks Home. David, thank you again for your time today. You were telling me about the office here. Yes. This where I’m standing now in front of the fireplace. This was the superintendent’s living quarters. This is where we lived—my mom and dad, and my sister, my brother, and myself. We lived here. This was the entrance—the main entrance—the office. That’s where we kept all the records. There was a driveway that came up in the front here and made kind of a turn and people would come up and stop in front of the office. And whatever their business was, we would take care of it here, because we lived right next to the office. So it was real convenient. But this was where we lived. We lived in here. It was good. This has been opened up. The partitions—this has all been opened up into the dining area. That was all closed when we lived here. It looks small now, but it was large then. But it was a lot of fun here. This was back in the late 50s-early ‘60s. But my sister and my brother stayed on this side—in the superintendent’s side—and I stayed over in the office where Kim [Nelson] is right now, that was my room. There was[sic] two rooms where the office is—two small rooms. They opened that up and now she’s in—where her office is that was my room where I stayed. How about that. So there were two rooms there and you had one of them? And how old were you again when you lived here? I was around 15—15 years old. And how many years were you here? We were here approximately four years living here. But I got used to the elderly folks, and it was a good part of growing up. It was a lot of experience, a lot of knowledge, and things that I listened to back then—stories and all. They were fantastic. It was just like reading a book, when you talk to some of the people that were here. And it was great. That’s interesting. About how many residents were here then? Do you know? I would say probably 10-15 in this section. We had the infirmary in the back. Of course it’s not there now. Rachel Lee ran the infirmary with a nurse, and she had her patients, and sick people were there. And there was the colored section where they lived and there was probably eight people living in there. But there would be people coming and going, but most of the time we kept the same ones. They just lived here ‘til something happened to them. But it was good that this road came around from the front of the office. It came around the building and all the way around that building, and made a loop, and came out over there where you parked your car in the parking lot, and came back out to the road. And the ambulance—if they had to pick up someone from the infirmary or the doctor or whatever, they could make a loop and all the deliveries and everything. Now when you pull up—we’ll walk to the kitchen here. This was our entrance right here in the kitchen on the superintendent’s side. We parked our cars out there. There was an oak tree. This was all field out there. To your right, on the south side, there was a garage and a chicken coop. It was probably 50 by 50 and we probably had 150 chickens to 200 chickens. Behind that was the wash shed—the infirmary. And the coloreds stayed in their building. We would take—certain days we would go out and gather up the chickens and we would have to slaughter up the chickens. We had fresh chickens and put them in the freezer. We also had pigs and cows and stuff like that. We had plenty of meat, plenty of milk, and it worked out good for everyone here. That[?] sounds like it. What were some of the responsibilities you had here, if any? Oh, yeah. Yeah. Back in the day you did your part. I would get up in the mornings, and I’d get dressed and sometimes put on an old pair of pants. Not my school clothes, but I would come over and back up between the little trellises out here. This is the dining room and kitchen here, and I would back up there with the truck. We had a five-gallon pail with leftover milk, scraps. And we would get commodities like cornmeal with bugs in it or something once in a while and I would take all that, throw it in the five-gallon bucket with milk, put it in the back of the truck, drive down the road, and I’d slop the hogs every day. That was my morning chore. So the reason why I said about pants was that sometimes it would spill on ya, so you had to be real careful. But I had to do that and a bunch of little things in the morning. Make sure everything was in its rightful place, kinda do a little walk round—my dad did and I did. It was a family thing. Then we’d walk down to the road and catch the school bus, or drive to school, or someone would pick us up. You said you went to Seminole High [School]? I went to Seminole High on French Avenue on top of the hill back then in ’59. The road out here—the four lane—was just getting finished. It was two lane. They were just finishing it. That made it nice. But it was good. In the afternoons, I would come in after school and I’d kinda go through the same process of changing clothes and getting everything. We had a Snappin’ Turtle lawn mower—one of those old mowers with a turtle head on the front—and we would mow grass. That was part of it. We’d mow grass and Will—he was one of the black guys. He was on crutches. He would be at the barn at a certain time, and all the cows would come in, and he’d milk all the cows. I’d go through the orange grove—that was all orange grove on that side then—I’d go down through the orange grove to the barn, and I would bring the milk back, because he couldn’t do it. And I’d carry the milk, bring it back to the kitchen so they would have fresh milk. Usually we’d have two full buckets. That was part of my job in the afternoon. There was[sic] always things to do. Sometimes in the afternoons or on the weekends, I would even go to the infirmary or in the back where the blacks lived—the colored folks lived—and pick them up and take them across—here’s a lake in Lake Mary you could go through the woods and around, and the man that had the lakefront property would let them fish. So we would go fishin’. There’d be four or five that’d want to go over. Sometimes we’d leave ‘em for two-three hours with water and everything and then go back and get ‘em. They’d bring the fish back, clean them, and the kitchen people would cook ‘em. So that’s the way it went. So every once in a while you had fresh fish too? Oh, yeah. It was great really, really good. It was a good life living out here. I enjoyed it. Kept us all busy and you got to see a lot of people and that’s what it was all about really. Sometimes I’d be sitting in here—and another part of my duties were, someone pull up—there was a funeral home in Sanford and they’d bury folks in the [Seminole] County cemetery here by the college. They would pull up in the hearse, and I would go to the office, and give them a number, and they would have all the paperwork. Or they would give me a number. I forget how that went back then. I would go over to the cemetery with them and they would have a hole. They had someone—they would drop him off and dig the grave. Sometimes the graves weren’t real deep, because of the water table. But they had a pine box, and I would help them lower the remains—the body—down in to the gravesite and basically, you know, cover it up. And I’d bring back the number or whatever and it would go into the book. But that was just another thing that I did. But yeah. I helped bury a number of people over there. Sometimes the cows would get out of the fence and they’d trample through over there and you could see where they stepped in. it was just a common thing though. It was something to be expected when you had animals like that in a cemetery. We had a guy that was in the infirmary—Sam McFadden was his name. I was 15 years old and I told him—I said, “Sam, when I turn 18, I’ll take you back to Oviedo.” That’s where he was from. He was a black guy. Really a nice person. He had no legs at all. He was over there probably six-eight years. I forget how many years. So the week I turned 16, and got my regular license, I pulled around, got him down the ramp, picked him up, put him in the passenger seat, and we went to Oviedo. All day long. He hadn’t been over there in years. So I drove him all around Oviedo so he could see people he knew. He would show me where to go and tell me which way he wanted to turn. He had a wonderful day. People gave him money and everything. That probably made his day, you know. He remembered that the rest of his life. He was a real good person. I liked doing things like that. It was part of the experience I got from living over here. He was a great person. Just a little thing I could do to help out. That’s fantastic. I bet he did enjoy that. Oh, yeah. But he didn’t weigh much. I could pick him right up, with no legs. But, uh, this area—this area was the dining room and they would eat their breakfast, dinner, and supper in here. The kitchen was right through there and they would cook everything. Where the books and all are, that was the pantry. That’s where we kept all the food and stuff. And the little walkway out here— where the colored dining room was. They came up, they ate out here, and the other folks in here ate in here. So they essentially put the kitchen in the middle. The kitchen—right. It’s where it is now. I guess it’s still a kitchen in there. But that’s what that was. I don’t know if they’ve done anything with the little extension out here or not, I think it’s basically for storage now. What was—what was that? The storage [inaudible]? Yeah. They would sit on the porch down there. And there was two—there was Willie and Lily. She was ‘bout as big around as she was tall—real short. But they would go down here on [U.S. Route] 17-92—there was big oak trees down there then. They would take their chairs—they had a couple chairs they left down there. I took them down for them, and they would sit there and watch the traffic and wave. People got used to seeing them every day just about. Some people would actually stop and give them money. They’re the same ones that we would take fishing. They loved to fish. It was really great. They enjoyed it. It was something for them to do. ‘Cause you know a place like this you get a certain age, it gets a little boring and a little excitement—you see new people, new cars. And somebody stop to chat. Oh, yeah. People would probably knew[sic] them—that knew they were here. You know, there’s a lot of sad things. People that you get acclimated to living in this area with older people. And you’re a teenager, and you hear all the stories, and you like these people. Then they get sick and pass away. It’s kinda hard on you. But it’s an experience that you never forget. It’s good really. It was really good for me. And I remember a lot of the stories. They were great. Like back years ago when Florida had dirt roads and people rode horses and things like that were some of the stories. So you heard some of those? ‘Cause some of the people—back in 1960, they were 80 years old, so you know they didn’t have the cars. That’s the way it was. All the women stayed in one section and the men stayed in the other. Sometimes they would get to arguing—well, older people like that is—was—kinda comical. But they would. They would get serious and would start arguing. We had one out here named Beautiful Lee. That was his name. He had a business here in Sanford. We had another here, Mr. Barfield. And they didn’t get along too well. Sometimes you had to straighten them out. My dad—he had his hands full. When we first got here, the beds were really bad. The mattresses were old and soiled. The first thing he did was go to the [Seminole] County commissioners to get funding to where Echols Bedding Company years ago. Came out to haul the mattresses out and put all fresh mattresses in. And like—the people we buried out there. They were just buried—buried without any nice clothes. And dad got to where—they might’ve got them from Goodwill [Industries International, Inc.] or wherever back then—but they had suits when they were buried instead of being buried in a pine box. It was the little things that mattered. He was good about that. So you’re saying your dad went in front of the commission to get the beds? Oh, yeah. When he needed something. Homer Little was on the board of county commissioners back then, and he talked to him about a lot of things. He would go to the meetings and whatever he would bring it up—whatever he really needed. There wasn’t a lot of money, but still yet you know things needed to be done. Because, to be honest with you, it still happens every day. And I hate to see it, but people bring their parents out after they get sick and everything and they can’t help themselves. They bring them out here and sell their house. The kids get their house—get everything. And for the first week or two they’re out here continuously visiting. Then it starts dropping off. Then it’s two weeks. Well, then it’s six months. Then maybe it’s birthday or Christmas. And that’s the way it happens. It happens all the time. It’s sad, but it’s true. I would say 85 percent. Of course, it might be a little different now. I’m sure it is. But it was still sad back then. That’s just the way life is. But it was nice. We had one man back there next to me—next to my room. And back then, you could smoke. He had emphysema so bad. So they gave him cigarettes for his emphysema that he could smoke that, I guess, helped him or something. Those things smelled so bad. I remember his smoking at night or in the daytime, the whole hallway would smell of his cigarettes. I would have to go to my room and I didn’t like that. But, uh, it was nice. My brother and sister—they did a lot of work too. There was a little pool right out here in the front—a fishing pond—concrete fishing pond. It’s not there now. My sister, when she was in her teens, would walk up and down take pictures of her walking, because she thought she was something. She had her little small waist and all that then. That’s just the way it was. I had an old car. I put it in the garage back there that I worked on a little bit when I wasn’t real busy. It was good. The road department was real small down here, and if we needed something from the road department, we could get it and bring it back. It was pretty decent out here. Everyone seemed to work together. There’s so many things I really can’t remember. I know with the hogs—we would take them and—Mr. Humphrey was his name—from Lake Mary. He was really big man. He would come over a certain time of the year when it was cool and we would butcher the hogs. They would get so big and so fat from the milk and everything. We would butcher the hogs and then we’d take the hogs up to the freezer and, as needed, we would go there—get the meat—bring it back, and they would cook it. So we always had fresh meat. It was really good. We had beef too. We raised a few bulls and stuff like that once in a while. It was always something. It never stopped. Doesn’t sound like it. A very self-sufficient organization too, with as many chickens as were out there. Right. Yeah. We had chickens. We had the pork. Beef. We had eggs. We didn’t buy any eggs. We had like the commodities the corn meal was brought in. The government had left over stuff. And someone hit a deer or something like that, or poached one, they had venison. That’s the way life was back then. We had plenty of vegetables. People would bring stuff like different vegetables out here, and oranges. There was an orange grove all around the place. There was oranges galore. Course, they’re all gone now. Anytime you wanted a real nice orange, just go out and get it. And they did. The people that were able. The rest of them that weren’t able. They looked out for them. We had a pickup truck that we used. I would use it to go get things when I got my license. I would drive it back and forth in the mornings to feed the hogs—slop the hogs—and stuff. We also had a station wagon that we used. My dad would take the people that live here to the doctor, or to take them to town or something instead of taking them over to the infirmary, if they needed x-rays or something. There was one black lady. She was really young. I say young—she was probably in her 20s. She was in an accident or got shot or something. I forget what it was, but she couldn’t walk. She was in the infirmary. She didn’t have any money. The county had to take care of her. They took her back and forth to the doctor, kept taking her, not giving up on her. And you know she got to where she could walk. She got out on her own. From what I understand she got married and had kids. But that’s another one of the stories. Any time you remember one, give us a call. Yeah, yeah. We did a lot of things out here. I don’t know. I get to thinking about—there’s a few movies that I have. They’re the old 8mm. if I could ever get them off and transferred them over onto something—one of these days, it shows cars parked out here and where we were living we’d be coming in and out of this door, and the garage, the chickens, the whole area. It’s just a small video, but maybe I could put it together. Oh. That would be fantastic. Yeah. We had out little dogs and stuff. A little dog out here. I had one. We had a wreck down here on the side of the road, and my uncle had worked for Ratliff’s Towing. So I was over there, and walked down to see the car that had been left down there on the side of the road that had been there a couple days. I heard a little noise and there was a puppy under the seat. But it was part Chihuahua. It was a little, small dog. So I brought it back and named it Pooch. That was my dog. And she had the run of the place. Everyone loved her around here. She had the run of the place. Everyone played with her. She was really smart. The newspaperman would come up and make the circle and throw the paper out and we had—there was no air conditioning in here—we had fans. There was the screen door. She could hit it and open it up and then she’d run out. When I saw him coming up, if she didn’t hear him I’d say, “Paper, Pooch,” and she’d run out and get the paper and bring it back in. She was a smart little dog [coughs]. Yeah. It was basically self-sufficient. We took care of everything here. Laundry and the whole nine yards. The laundry was back here behind the garage. There was a building back there. That’s where the maids did the laundry. We had, I think, one or two maids that helped. My mom made out all the menus. She did the menus and helped with the cooking and the cleaning in here too. And the maids did the laundry and all in the back—back here. And my dad—if you go out the back and you go down, there was a boiler down there, and probably still is. That’s how the heat was in here. We had the big radiant things. They had a furnace down there. Actually, it was coal to start with. And we used to have to go down there at night and fill that thing up to keep it warm in here. Then they changed it over to diesel fuel or kerosene or something. Yeah. It had a coal chute. A truck would back up and dump it down in there. That was another job. There was[sic] always things to do. Always. But they’d get together—a lot of people would get together, like the folks in the back. They would get together sometimes on Sundays and sing and have a good time down there. We all did. It sounds like it. Did they keep you cracking on your homework—your schoolwork? Oh, yeah. Well, I kinda would go against the grain. You know how that goes. I still had to do it. Yeah. You gotta do that afterwards and everything. But on the weekends, being a teenager, you could go somewhere—to the drive-in or the skating rink that used to be up here on 17-92. Course, you didn’t need but a couple dollars. You could get a hamburger, hot dog or whatever, you know, for 25 or 30 cents. It wasn’t very expensive back then. Couple dollars’ worth of gas—you could go everywhere. We’d go—a couple of us would get together—two or three guys—ride around a little bit, go skating, or go to the movies, or hang out. The Movieland Drive-In was here then, years ago. Or the old Ritz [Theatre] downtown. There was a lot to do on the weekends. You could go to the beach. There’s not a lot of traffic like there is now. On [Florida State Road] 415, you didn’t run but about 55-60 miles an hour. The old cars would run real fast, but you didn’t run real fast, because you didn’t want to burn it up. You had to save it. But yeah, a lot of things have changed since way back then. Some for the good, some the not so good. Back when I lived in here it’s not like today. Life was simple. It wasn’t expensive. Taxes were cheap, and everyone knew everyone. Now it’s not that way. A lot of people you can’t even speak to them, because you don’t know what language they’re speaking. It’s completely different than what it was back then. But it was really down-to-earth and basic, even though you know it was hard, but it was good. It was really good. Sounds likes it. Um, you were talking about a brother and sister here at the time too. Were you the oldest or the youngest? My older sister, Helen [Scott], her last name is Atkinson now. I was in the middle. My younger brother is Edward Scott. He’s younger than me. Our parents are gone, but we stay in touch. They did a lot of work out here too. We all pitched in. And you said you moved to the area when you were six? Yes. I started at Lake Monroe School in 1950, I think. It was just a small school out there. It’s still there. They sold it and a doctor lives in it now. They converted it into a house. Back then, you see guys in first grade that was probably 10 years old, because they were late starting school or they didn’t come to school very often. They progressed on up they were older in the sixth grade. But it was a good school. I had a lot of fun there. Then I went to Sanford Junior High School on Ninth [Street] and Sanford Avenue. And then from there to Seminole High, out on the hill out there. And then the new Seminole High was built and I started my sophomore year there. Freshman year on the hill and then the new high school. They built the one that’s out there now. And it was all just palmettos and pine trees when they were building that. You just had to go out through there. Yeah. I went to high school there. Back where the college is here—that was just a nothing. It was just a power line road that went through. It went over to Lake Mary. That’s what we would use to go to the lake the back way. And some of us—myself and my brother—we would take our old clunker car. We didn’t have a license, but we would drive the back road through the woods and everything. It was a lot of fun [coughs]. The power line road was the one you were talking about taking people fishing? Yeah. You would go down to the road department, and turn left. Then go down, and then you could make a right, and it would take you back out to the cemetery and to Lake Mary Boulevard. It wasn’t much of a boulevard then, because it would dead-end up there before they opened it up and did all that. Or you could go to the road department and make a left, then it would take you down and around. It was just a mud hole on each side. It was a road built up for the power line use and it was a shortcut to Lake Mary. We’d go over there and go swimming or whatever sometimes. But there was nothing back there then. There was a lot of orange trees all around. This out in the front was a pasture. The pasture actually went out and all the way around and ended up almost past the cemetery almost to Lake Mary Boulevard back where the houses are. So the orange grove went that far? Or the pasture? The pasture did. The orange grove started from the road department—the end of their little road and then all back around this whole place around here was orange grove. This whole place around here was orange grove. Even back on this side, there was an orange grove going back. So there was a lot of oranges. I think we had five cows. I think Will milked about five cows. Plus, when they would have a calf, we would raise it up for beef or sell it or something or butcher it up. I’m not sure what happened to most of them. I know we always had plenty of meat in the freezer in town. I forget the name of the locker. It was there on Thirteenth Street where we kept everything. But they would cut it, dress it, pack it, freeze it, hang it or whatever we needed. You said up on Thirteenth Street was the freezer locker? That’s where it was. Back when Sheriff Poppy[sp] was the sheriff here years ago. I don’t know what else you need to know or if there’s anything you can think of. Um, I had a question about what they call the “Agricultural Building” now. The building back behind that’s part of the museum. That wasn’t here though. No. Back where the new building is now? The loop went around the back of this building, because nothing was here. Made the loop and that was the infirmary. That’s where the infirmary was. Rachel Lee was the nurse there. Okay. But that area is where the infirmary was, but it’s not the building that was the infirmary? Right. The infirmary was when you walk out this one door here, you go straight across the driveway and that was the infirmary. And then on the other side was where the coloreds lived—in their section there, in the corner down there. And the loop went all the way around the place. Okay. You were saying earlier about the big tree up front providing shade. Oh, yeah. The camphor tree. I was telling you earlier that I would go out on the porch with all the old men here, and I would sit out on the porch in the afternoon. It was a real good shade, and we would sit out there with the breeze blowing. That’s where I heard most of my stories from all the old folks. The men—they would sit out there, and they would tell me about the history of when they moved to Florida—whenever they’d come. And they rode horses, and they drove Model Ts, and there was a dirt road going to Orlando and all kind of stuff .and I guess that’s where the Crackers come in were popping the whips and stuff. It was interesting. We would sit under that tree, and it was a big tree then, on the porch. That’s interesting. Were they—did any of them work in cattle ranching? Any of the stories that you heard? Oh, yeah. They would move cattle in Florida for miles, especially around the Kissimmee area way back then. It was mostly swamp—a lot of it was swamp. They would talk about some of the things that occurred moving one herd of cows to the next place or wherever. Some of them, like I said, even in 1960—they were up in their 80s, so they knew a lot about this before any of us was even thought of. They lived a good life, a lot of them. And this was their last place. The last stop was here. They didn’t have anything else to do and here I am—15 years old—and I’m sitting out there just listening, and they loved to tell me their stories. Sometimes I’d hear the same story over two or three times, but it was still interesting. I bet so. Any railroaders? I was looking at some video when the railroad marker dedication was, but I didn’t know if anybody here when you were here who was involved in that. No. Actually there weren’t. I can’t remember anyone that worked for the railroad that was here years ago, but I do remember a lot of the trains. Growing up, I remember the diesels—when they first started running the diesels and stuff like that. I’ve seen steam engines and stuff. Not a lot of railroad people that I remember lived out here. Basically railroad people—I think the reason for that was when they worked for the railroad, they got a retirement. And see, their retirement took care of them when they got sick and that was basically the reason why they didn’t put them in the Old Folks Home. People that were out here were—they worked all their life and didn’t have anything left—basically, no retirement or anything else so they qualified for the [Seminole] County to take care of them, and that’s where they ended up. Their folks put them in here. So they were more the ones who worked for themselves in a way? Right. Some of them had businesses they were really doing good[sic] through the years. But like I said earlier, when they get to a certain point in their life or they get sick and their family can’t take care of them or don’t want to take care of them, and so they basically take away everything so they ended up here. It’s a cruel way to look at it, but they were actually better off here. They got waited on, they had plenty to eat, they had a nice place to sleep, and whatever, you know. If they really wanted to go visit someplace, their family would come up once in a while and take them out and bring them back so it wasn’t bad. It made it easier on everyone probably. Um, I had thought of another question. What type of work did your dad do before he got this job? Uh, my dad [coughs]—he was a used car salesman actually. He was in the Military. He could do about anything, really. Carpenter work or whatever. Whatever it took growing up to make a living, that’s basically what he did. But he was a car salesman. He was in a dealership. Well, I think the guy that he worked for and him were the only two, but they had a real nice car lot and he was selling cars. Buying and selling cars [coughs]. Interesting. Was it there in Sanford then? Yes. It was in Sanford. Of course, there’s[sic] buildings there now. Where his car lot was—actually years ago, when he first started selling cars was there on Second [Street] and Sanford Avenue. If you know where the post office is downtown, but there’s a lot right there with a big oak tree on it where Larry’s [New & Used] Mart used to be. Well, it wasn’t years ago, but that was a car lot. The tree wasn’t so big back then. They had cars all around on that corner there. Then they moved up like on Ninth [Street] and Sanford Avenue and sold cars up there. But yeah it was interesting. I always loved cars, I still do. I’ve got old cars and trucks. It gets in your blood. But, yeah. That’s what he did. Uh, you mentioned earlier too—one of the trees out back here on the property on the Old Folks Home was an oak tree? Yeah. There was some oak trees. They were having a fundraiser—or I don’t know what it was—but they wanted to sell oak trees for $100, or whatever it was when they were doing it. And you could dedicate it or whatever to whomever you wanted to for the members that was here, and I got one in memory of my mom and dad, Grady and Flora Scott. But they didn’t put any markers or anything on it, so when you go out there, you think it’s just like another tree planted. I would like to see them one of these days go back in the records to find out who did that and put some little something in recognition of who it’s for. But they haven’t done that, and I’m sure it’s an oversight that never got taken care of. I’m sure it is too. I would like to see—if you don’t mind, when we’re wrapping up, if you’d show me which ones they were out there we can get that documented. Anything else for your childhood that sticks out for you—growing up here or even before you got here—that makes you chuckle now? Oh, there’s a lot of things [laughs]. I was a middle kid. I’ve got a younger brother and an older sister. I was the one that was in between. Growing up, if you got in trouble in school, you got tanned a little bit by the principal. Then you got home your mother did it. Then when your dad got home he took care of it. So it was one, two, three. And you didn’t do that anymore. I basically raised my kids the same way—in a way that I would set them down when they got in trouble and we would talk about it and we’d determine the punishment. It would be kinda up to them. They turned out really, really great. Hopefully my grandkids will be the same way. But it’s not like it was. It’s a little harder. There’s not a lot of “Yes, sir,” “No, sir” stuff anymore. Not a whole lot. No. My two boys still say, “Yes, sir” to me. They’re in their 40s. There’s a lot of things that I try to instill in people, especially the younger generation—my kids, my grandkids, or whatever. Because I’ve seen so many people that’s passed on—I’ve been with them when they’ve passed on. Even at a young age, like I was out here, and you miss them. But when you see a person that’s 80 years old or 60 years old or whatever, and they’re sick and you’ve been knowin’ this person for a long time—it doesn’t matter if you know them or not. But when you see them there and they don’t recognize you hardly but they try—don’t think of that person as what you see. Think of that person that you knew. That same person’s still inside there. Talk to them just as if they were 20 years old or 30 years old, or when you knew them and times were good. Talk to them the same way as when you knew them, because they’re still the same person. I don’t care if they weigh 60 pounds with cancer and they’re 80 years old and they’re dying. They’re still the same person as they were when they were 15 years old or 25, and out here dancing and having a good time. And that’s what I like to see people think of instead of, you know. I don’t want to be around them. That’s the wrong attitude to take. The person’s still in there. That’s the way I look at it. There’s a lot true in that. Um, yeah. We could walk around there to the trees and then we’ll see what we can make note of here. Back out this way, right? Yes. This was the living room. This was the living room? This was where they sat around and watched TV. Like I said, my room was down there on the end where Kim’s office is. And where your office is, that was two rooms too I think. So the—and then, were the—you said the women and men were separated? Yes. The women I believe lived in this area and the men lived in the other wing. And then the colored section was out there? Okay.Thanks. I’m trying to orient. I thought they had some pictures out here. I don’t see anything. Well, they do change the pictures around. Every now and then too. Sorry. Excuse us. That’s okay. I just don’t want to step on it. Thank you. This right here was the colored dining area. Right. We use that for storage now. The driveway came here around the building. About where those gates are was a building—a big wood building—and that was where the colored folks lived. And that was orange grove. Straight on down—probably about where that stop sign is, where that car just went through—through the orange grove that was the barn. The cows would come across the road in the evening. They would walk right across, and Will would milk them, and I would go down and bring the milk back up to the kitchen here. This is the kitchen. Straight across here was the infirmary where the new building is. The driveway went around to the infirmary. To the left back in this area was a washhouse. Right here was a garage, and the other side of that was a big chicken coop. That’s where we had the chickens. On down in the front down here, across from the barn on the right, was the hog pen, and that’s where I had to take the hog slop. This was all orange grove, even all the way around in the back. Where that building is over there that was orange grove. This was a field out here all the way over to where the fire station is. We had to keep a lot of that mowed. You said the pasture came up this way? The pasture part actually started in front of the building right here to the left of the driveway. That was pasture all the way around. On the other side of the road, all the way around way back past the cemetery. There’s a lot of acreage back there. It was all pasture. I’m sure you know where the cemetery is. I haven’t been, so I don’t have an idea. So in between these two porches here? Yeah. Let’s take a look. You go through there and go down to the right. And you’ll see it looks like a cellar, but that’s the boiler room. They’ve changed it now. The oak trees have got to be this oak tree, that one. I think they’re planted all around. Now were you here when any of them were planted? No. It was probably four or five years ago. Now this was all driveway here. And by where we’re standing now is where the garage was. And the chicken coop was on up. There was some big oak trees planted there, that’s where we parked the cars on the superintendent’s side. Because this was the front? Right. This was our entrance. We used this entrance. The office is in the front right there. Deliveries would come around back up between the two buildings here and go into the kitchen. They’d back the trucks in there to drop things off and pick things up. It makes sense, but it’s different to see it, because what is the front entrance now was the side. Right. The office was the main thing back then. Back in the late ‘50s, this was a two-lane road. Then they started to changing[sic] it and made it into a four-lane. And they finally opened it up. There was some oak trees down there. I think they’re gone now—the big oak trees—but there’s where Lily and Willie used to sit and watch the traffic under the oak trees. On the other side of this road here? Oh, yeah. Right there on the edge of 17-92. That’s where they would sit and people would blow their horns at them. You said it was two-lane then? Well, actually it was four-lane, but the road wasn’t finished until about 1960. Then it was four-lane. There used to be a little tavern right there. I guess the building’s still there. They had some bad wrecks people pulling out after it was four-lane, because they weren’t used to it. I do have some movie clips of coming up here and parking cars and walking to the garage and stuff here. Some of my friends—when I was a teenager, we’d come back from the beach and walk up and down through here, play with the dog and stuff. If I could ever get them all together. But the oak trees, I guess, are these. I’m not sure. You can see them planted all around. I have no idea how many they ended up planting. I don’t either. We’ll see what we can find out about that. Well, it would be nice. Even if there was just one little sign that said, “Oak trees planted in memory of…” Or something like that. That’s a nice building. Yes. It is. It’s a great space in there too, for displays and presentations. I’m sure you’ve seen it. The infirmary was there and that’s when I pulled up there. There was a ramp to the infirmary. And when I was 16—I turned 16—I pulled the car around and I saw Sam McFadden, with no legs—black guy. I would visit him. He’d come out and get a little sun once in a while. I told him, “Sam, I’m going to take you to Oviedo when I get my license.” And he just couldn’t wait. When I pulled up there that day, and they wheeled him down in the chair to the car. I had the door open. I set him in that car. His face was all lit up. He’d been in there for so many years. He loved it. I think it did me more good than it did him. Sure. Doing something like that for somebody else. When they closed this place down, I tried to get in touch with him and the rest of them. They moved him to [inaudible] and whatever home. I don’t know what happened to him. I tried to do a follow up, but I never could. Is that home in Sanford? Yeah. It was on West Ninth Street I believe it was. They changed a few things around. Like I said, I don’t know where the pictures are out here. They used to have I don’t know how many pictures. I’m sure we still have them somewhere. Thank you very much for your time, Dave. I appreciate it. It’s not a problem. I enjoy doing it. I ramble on too much sometimes when I get to talking because most of the memories are really good. I try to delete all the bad stuff. [laughs]Well, for our purposes the rambling is good [laughs]. Yeah. There’s some bad stuff. Sam lived right here in this one room right here and he was an old man. A good friend of mine. He was real quiet. He loved it when I moved back here, because he had someone to talk to. Was he the one with emphysema? No. That was another man. They had moved him in there afterwards—after Sam passed away. Then I missed him. Then the other guy with emphysema cigarettes—oh, that about killed me. Then he passed away too. People—some of them stayed here a few years. They hung around. But a lot of them were really bad when they brought them in. If you can remember anything or want me for anything, just give me a call. Holcomb, Susan and Scott, David. “Oral History of David Scott.” RICHES of Central Florida accessed April 25, 2019, https://richesmi.cah.ucf.edu/omeka/items/show/4788.